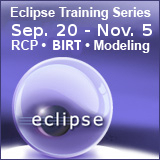 As part of the Eclipse Foundation Training series, there are scheduled 5 classes on "Advanced Eclipse RCP". This is the perfect class for people, who have developed Eclipse plug-ins for the last year or so and now wants to know more about some of the more advanced subjects in Eclipse plug-in development. The title of the classes is "Advanced RCP Eclipse", but with the exception of one subject, all the subjects of the class are just as relevant if you're developing Eclipse plug-ins for the IDE. Wizards - which is basically here because we don't have time for this subject during "Development in Eclipse RCP". Long-Running operations and Jobs and how to make the interaction between these and the UI as painless as possible. How to use Eclipse Adapters. While the Adapter framework arguably is one of the more difficult to understand and use properly, the is also a framework that will solve many of the problems you might face is larger non-trivial applications especially when used in conjunction with the menus extension point and handlers. The Data Binding framework and how to use this to cut down on the boilerplate code in the application. How to handle virtual trees and tables when either the amount of data is large or the retrieval time is long for items in the tree or table. How to declare and implement your own extension points. Not that this is especially difficult, but there are a number of god design patterns around this that can help reduce the code involved and also make your application react properly when plug-ins are either added or removed from the running aplication. You can see the complete list of subjects in these classes and where to attend of the classes on the training page. Although the page on the training says "Prerequisites: Solid Java experience, experience with Eclipse SDK as a Java development environment and notions of Eclipse RCP", I know from past experience that mere notions will make for very hard three days. In the classes we assume you know about commands, views, perspectives, etc - basically the subjects from the "Development in Eclipse RCP".